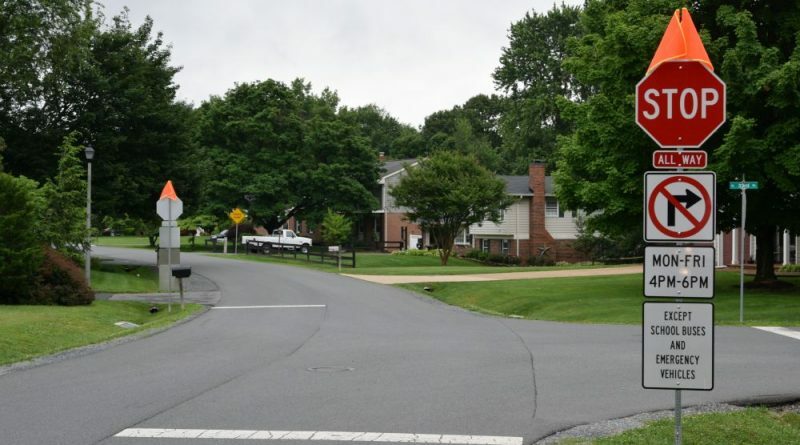 Although residents in Purcellville’s Country Club Hills and Catoctin Meadows neighborhoods have been forced to adhere to town-imposed traffic routes since February, their drive to find a different solution to the community’s cut-through traffic issue shows signs of progress. The town on Monday night held its fourth technical advisory committee meeting to discuss resident’s concerns. Led by Interim Public Works Director Dawn Ashbacher, committee members talked with around 25 residents about the results of signage, in place since the beginning of May, restricting cut-through traffic during weekday morning and afternoon rush hours, as well as a few possible options moving forward. “We’re just in the midst of a process of gathering information,” Ashbacher said. While cut-through traffic in the community has been an issue for three decades, residents began to more actively voice concern late last year after hearing that Virginia Regional Transit would open a commuter parking lot along Hirst Road in July. In response to the outcry, the town in February installed 10 removable barriers between East Country Club Drive and Ashleigh Road, rerouting traffic to West Country Club Drive and along Glenmeade Circle. Those barriers were left up until May 23, three weeks after the town installed signage to prohibit traffic from turning onto 33rd Street from Main Street from 6-9 a.m. and from Country Club Drive onto 33rd Street from 4-6 p.m. In February, the town formed the advisory committee—made up of multiple town and county staff members and traffic experts—to discuss the program’s progress with residents. In Monday night’s meeting, Ashbacher first presented residents with recent town-collected data. According to the numbers, traffic counts on West Country Club Drive decreased by 78 from 6-9 a.m. and 48 from 4-6 p.m. after the barriers were removed and the signage was installed. On Glenmeade, they decreased by 63 from 6-9 a.m. and 38 from 4-6 p.m.
Ashbacher and several residents also mentioned that police enforcement was an important factor. According to Acting Police Chief Joe Schroeck, the department has issued 125 warnings to drivers cutting through the neighborhoods since the signs went up. When asked why officers are issuing warnings instead of tickets, Schroeck said that he was looking specifically for repeat offenders and that the goal for patrolling the community was not to write “a bunch of tickets,” but to change drivers’ behaviors. Schroeck said that if he or his officers were to write tickets, it would be for “failure to obey a highway sign,” which carries a $30 fine and three points on a driver’s license. Residents expressed concern about the existing signage, asking why it was installed only at the southern entrance to the neighborhood and not also at the northern end and why the morning peak hours are longer than the afternoon. Ashbacher said that the town would look into making changes. Many residents also agreed that the signage is working well. Installing barriers along 33rd Street was also discussed, generating the most dissent from residents among all the options. Senior Transportation Engineer for ClarkNexsen Whitney Duffy said that barriers could be installed both at the Main Street/33rd Street intersection and 120 feet south of Holly Lane, blocking off 280 feet of 33rd Street. Duffy said that if this option were implemented, the curbs on Holly Lane would need to be widened to allow vehicles to turn around. Loudoun County Chief Fire Marshal Linda Hale said that closing a section of road off completely would go against the county fire code. “It gives me cause for concern,” she said. Residents also proposed installing “local traffic only” signs, to which Schroeck said that there would be no way for his officers to tell if someone is a resident or not before pulling them over. Committee member Tom Folse, the assistant district traffic engineer for VDOT’s Northern Virginia District, said that it’s not typical to install such signs in a situation like this. He said that they’re normally used when VDOT has to temporarily close a road but still allow access for homeowners. According to Ashbacher, the current signage will remain in place through the summer for the town to see how it fares when Alder School Road, which is closed for reconstruction as a paved road, reopens by the end of the month, when the VRT lot opens early next month and when school starts back up in the fall. The next committee meeting is set for the end of July.